The Physiotherapist prescribed the exercise of Fractured Ankle Management After Surgery. These Are Usually The Best Exercises. With The Help Of these, we can gain the perfect range of motion and perfect strength fractured ankle. Affect Fractured Ankle Management. Post-immobilization contractures and adhesions develop in the joint capsules and surrounding tissues. Any time a joint is immobilized in a cast or splint, typically after dislocations and fractures. Joint pathology of foot and ankle as the result of RA commonly affects the forefoot early in the disease process. Later the hindfoot, and least frequently the ankle affects the forefoot. Involvement may occur in the MTP, subtalar, talocrural joints of the foot, leading to instabilities. Painful deformities, such as hallux valgus and subluxation of the metatarsal heads, that increase with the stress of weight bearing. Tendon rupture of foot and ankle musculature also may occur as the result of chronic inflammation and contribute to deformity. Degenerative joint disease (DJD) and joint trauma. Contractures and adhesions in the capsular tissues leading to joint hypomobilities as well as in the surrounding periarticular tissues. It may occur any time the joint immobilized after a fracture or surgery. Symptoms commonly affect the MTP joint of the great toe, causing pain. During terminal stance, there are a shorter stance and lack of smooth push-off. In RA, many of the following impairments and deformities occur with progression of the disease. 18,92 With DJD and post-immobilization stiffness, only the affected joint or joints are limited.16 Functional limitations and disabilities occur primarily as a result of a loss of weight-bearing abilities. When symptoms acute, the patient experiences swelling and restricted, painful motion, particularly during weight-bearing activities. Chronic symptoms restricted motion decreased joint play and a firm capsular end-feel in the affected joint. Decreased mobility in the proximal and distal tibiofibular joints. Restricted accessory motion in these joints usually occurs with periods of immobilization and limits ankle and subtalar joint motion. Passive plantarflexion limited than dorsiflexion. Subtalar and transverse tarsal joints. Progressive limitation of supination develops until eventually the joint fixes in pronation with flattening of the medial longitudinal arch. The close-packed position of the tarsals (supination) becomes more and more difficult to assume during the terminal stance. MTP joint of the large toe. Gross limitation of extension and some limitation of flexion develop; the rest of the MTP joints are variable. Deformities occur due to a variety of factors including but not limited to muscle imbalances, faulty footwear, trauma, and heredity. This deformity in the great (large) toe develops as the proximal phalanx shifts laterally toward the second toe. Eventually, the flexor and extensor muscles of the great toe shift laterally and further accentuate the deformity. The bursa over the medial aspect of the metatarsal head may become inflamed and the bone hypertrophies, causing a painful bunion. Narrowing and eventual obliteration of the first MTP joint space occur with progressive loss of extension. This affects terminal stance by not allowing the foot to roll over the metatarsal heads and great toe for normal push-off. Instead, the individual turns the foot outward and rolls over the medial aspect of the large toe. This faulty pattern accentuates hallux valgus and foot pronation, and usually, the MTP joint is quite painful. Dorsal dislocation of the proximal phalanges on the metatarsal heads. If this occurs, the fat pad, which is normally under the metatarsal heads, migrates dorsally with the phalanges, and the protective cushion on weight bearing is lost, leading to pain, callus formation, and potential ulceration. Claw toe (MTP hyperextension and IP flexion) and hammer toe (MTP hyperextension, PIP flexion, and DIP hyperextension). These result from muscle imbalances between the intrinsic and extrinsic muscles of the toes. Friction from shoes may cause calluses to form where the toes rub. Muscle weakness and decreased muscular endurance. Inhibition resulting from pain and decreased use of the extremities leading to impaired muscle function. The sensory receptors in the ankle joints and ligaments, as well as in the muscle spindles, provide important information for posture and movement, known as the ankle strategy. The ankle strategy is used in balance control during perturbations. Faulty feedback and balance deficits occur when there is instability, muscle impairments, or arthritis. Impaired balance may lead to frequent falling or fear of falling and thus restrict community outings. When symptoms are acute, weight-bearing activities are painful, preventing independent ambulation and causing difficulty in rising from a chair and ascending and descending stairs. Because of decreased ankle and foot mobility and resulting decreased length of stride, distance and speed of ambulation are decreased; the person may require the use of assistive devices for ambulation. If pain, balance, or restricted motion is severe the person will be unable to ambulate and, therefore, requires a wheelchair for mobility. In addition to physician-prescribed medication, intraarticular injections of corticosteroids, or nonsteroidal anti-inflammatory medications, and therapeutic use of modalities the following are used to manage painful symptoms. Manual therapy techniques for Fractured Ankle Management. Gentle grade I or II distraction and oscillation techniques may inhibit pain and move synovial fluid for nutrition within the involved joints. Orthotic devices. Orthotics and well-constructed shoes help to protect the joints by realigning forces and providing support from faulty foot postures.45,62,65 Such support has been shown to decrease pain and improve functional mobility. Splinting or bracing may also be used to stabilize an arthritic joint. Passive, active-assistive, or active ROM. It is important to move the joints as tolerated. If active exercises are tolerated they are preferred because of the benefits of muscle action. Aquatic therapy. Aquatic therapy is an effective method of combining nonstressful buoyancy-assisted exercises with therapeutic heat. Muscle setting. Apply gentle multiangle muscle-setting techniques in pain-free positions and at an intensity that does not exacerbate symptoms. Initiate exercises and mobilization procedures at a level appropriate for the condition of the patient. In Fractured Ankle Management Determine which articulations are restricted owing to decreased joint play, and apply grade III sustained or grade III and IV oscillation techniques to stretch the limitations. Patient position and procedure While Fractured Ankle Management: Supine with hip and knee flexed and heel on the table. Stand at the foot of the table facing the patient and contact the patient’s anterior tibia with the palm of your hand (for the right foot use the left hand). Produce a pain-free graded posterior glide of the tibia on the talus. The patient should now unable to plantarflex. While maintaining the posterior tibial glide grip the talus with your other hand (for the right foot, use the right hand) and create a passive end-range plantarflexion movement, causing the talus to roll anteriorly. In Fractured Ankle Patient position and procedure: The patient stands with the affected foot placed on a chair or stool. Kneel on the floor facing the patient with a mobilization belt around your buttocks and the patient’s Achilles tendon. Place the web space of both hands around the neck of the talus with the palms on the dorsum of the foot. Hold the foot down and back and the subtalar joint in neutral pronation/supination. Use the belt to produce a pain-free graded anterior gliding force to the ankle joint. While maintaining this mobilization, the patient lunges forward, bringing the affected ankle into dorsiflexion and causing painless end-range loading. Repeat in sets of 6 to 10, reassessing for effect. Initiate resistive exercises at a level appropriate for the weakened muscles in a fractured ankle. Low-load, weight-bearing exercises may initiate in a pool or tank and progressed to full weight bearing as tolerated. Initiate protected balance exercises, and progress the intensity as tolerated. Determine the level of stability and safety during ambulation and continue use of assistive devices if necessary to help prevent falls. Low-impact aerobic exercises should initiate early in the treatment program and progressed as the patient is able. Repetitive exercises in a pool (water aerobics), swimming treadmill walking and bicycling may a kind of helpful. Surgical Interventions for Early and Late-Stage Ankle or Foot Arthritis and Joint Deformity. Total ankle arthroplasty (TAA) an option for carefully selected patients with disabling pain associated with advanced, symptomatic arthritis of the talocrural joint whose only surgical alternative ankle arthrodesis. This procedure provides pain relief while preserving functional motion of the ankle and therefore reduces stresses on adjacent joints more effectively than does arthrodesis. TAA most appropriate for individuals who relatively sedentary and do not expect to participate in high-impact recreational activities or heavy labor after surgery. contraindications include active or chronic infection of the ankle, severe osteoporosis, impaired lower extremity vascular supply. Advances in prosthetic design, beginning in the late 1980s and early 1990s, based on a more thorough understanding of the biomechanics of the ankle and foot, incorporated sliding and rotational motions into implant systems. Because contemporary prosthetic designs more closely mimic the characteristics of a normal ankle joint, ROM available in several of these systems now approaches that of a normal ankle.109 Changes in design combined with improved surgical techniques, such as better soft tissue balancing and ligament reconstruction, and the availability of new implant materials and cementless fixation led to current-day, “second generation” TAA (Fig. 22.6). These new implant designs, which minimally constrained or semiconstrained, completely resurface the tibial, fibular, and talar articulating surfaces using either a two- or three-component system. Although there are numerous variations of operative procedures involved in a TAA, the following represent key components.4,33,51,91 An anterior longitudinal incision between the tibialis anterior and extensor hallicis longus tendons is the most widely used approach for TAA. The extensor retinaculum and capsule are incised to expose the joint. The joint is débrided and osteophytes are removed. An external distraction device is used to separate the joint surfaces and facilitate bone resection. Small portions of the distal tibia and talar dome excised, preparation of the joint surfaces. In some cases, the medial and lateral malleolar recesses also resurface. Trial implants inserted, and ROM checked to certain that at least 5 of dorsiflexion possible. If limited contracture of the gastrocnemius-soleus muscle group, a percutaneous lengthening of the Achilles tendon performed. Fracture of the medial or lateral malleolus during implant insertion→the necessity for fracture stabilization with internal fixation. Malpositioning of an implant→chronic ankle instability, subluxation, dislocation, early mechanical loosening, or premature implant wear. Laceration of the posterior tibialis tendon during bone resection due to its close proximity to the medial malleolus→for tendon repair. Nerve injury, usually the superficial or deep peroneal→impaired sensory or motor function. Insufficient soft tissue balancing or reconstruction of→chronic ankle instability or deformity. Delayed union or nonunion of a tibiofibular syndesmosis fusion→an extended immobilization and non-weight bearing period. Hindfoot arthritis (most often the subtalar joint)→pain and impaired weight-bearing abilities. The ankle placed in a compression dressing and immobilized in a neutral position in a well padded,short-leg, posterior splint. The duration of continuous immobilization varies depending on the type of implant fixation used and the types of surgical procedures performed during the arthroplasty. For example, if a tibiofibular syndesmosis or subtalar fusion performed, no motion allowed for 6 weeks or until evidence of bony union. In Fractured Ankle Management patient must always wear an ankle immobilizer when initiating weight bearing after TAA. Recommendations for the time at which weight bearing is permissible after cementless fixation range from a maximum of 40 pounds 33 or weight bearing as tolerated4 immediately after surgery to non-weight bearing for 3 weeks or more.86 If a tibiofibular syndesmosis fusion performed, weight bears not permitted for at least 6 weeks. The first phase of postoperative rehabilitation, which extends for about 6 weeks, focuses on the patient becoming functionally mobile immediately after surgery with attention to protecting the operated ankle and controlling postoperative edema. Strengthen the nonoperated lower extremity and upper extremities using resisted exercises in preparation for ambulation. Regain active ROM of the operated ankle using gentle nonforceful motions when it permissible to remove the immobilization and if wound heals sufficiently. The following interventions are recommended to meet these goals. Continue or initiate active ROM exercises of the operated ankle and foot. Stretch the plantar flexors, if dorsiflexion restricted, using towel stretches in a long-sitting position, or the patient stands on a wedge for an extended period of time. Perform low-intensity, high-repetition resistance exercises in nonweight-bearing and weight-bearing positions. Initiate a stationary cycling program and progress the speed and distance of ambulation to increase cardiopulmonary fitness and lower extremity muscular endurance. The amount of dorsiflexion required during pedaling can adjust to rais or lower the seat height. To the extent weight bearing allows, perform a progression of bilateral and unilateral balance activities. Arthrodesis most frequently used surgery for late-stage arthritis of the ankle or one or more of the joints of the foot and toes. It typically procedure of choice for relatively young, active patients with post-traumatic arthritis and gross instability of the ankle and hindfoot. All type of arthrodesis involves the use of bone grafts coupled with internal fixation devices or occasionally external skeletal fixation for bony ankylosis. Arthrodesis at the ankle or foot almost always performs through an open approach. Over the past decade, however, arthroscopic or arthroscopically assisted arthrodesis of the ankle to become an option for patients with severe pain at the tibiotarsal joint but without significant field deformity Specifically, an arthroscopic approach cannot be used if a varus or valgus deformity greater than 5 to 10.102. The most consistently suggested benefit of an arthroscopic approach reduces the rate of wound healing complications because of less disruption of soft tissues during surgery. When the tibiotalar joint fused, positioned in 0 of dorsiflexion, 5 of hindfoot valgus, and 5 to 10 of external rotation of the foot on the tibia to match the rotation of the opposite lower extremity. Although ankle arthrodesis provides pain relief and ankle stability, dorsiflexion and plantarflexion lost, consequently altering the biomechanics and speed of gait and increasing energy expenditure during ambulation. Severe instability or chronic malalignment and deformity of the hindfoot, such as pes valgus or pes planus, and pain as the result of advanced hindfoot arthritis may require a triple arthrodesis or a single-joint fusion, such as talonavicular or talocalcaneal (subtalar) arthrodesis. A triple arthrodesis, often indicated for a rigid hindfoot deformity, involves fusion of the talocalcaneal, talonavicular, and calcaneocuboid joints.66 A single-joint fusion, such as a talonavicular arthrodesis, may suffice to correct a chronic but flexible behind foot 23,49,87 In most instances the behind foot positioned in 5 of valgus in each of these fusions. Arthrodesis of the first toe. Fusion of the first MTP joint for hallux rigidus and hallux valgus provides relief of pain, most notably during ambulation.1,17,41 The position of fusion rotate 10 to 15 of valgus and 15 to 30 of MTP extension. This allows adequate push-off during ambulation but also enables a patient to wear some types of commercially available shoes.14,17,41 If the lateral MTP joints also involved, a fusion of the great toe is performed after, not before, excision or implant arthroplasty of the lateral joints. Fusion of the IP joints of the toes in a neutral position for hammer toes, usually occurring in the second and third toes, provides relief of pain for ambulation and correction of deformities of the toes to improve shoe fit. The overall rate of complications associated with arthrodesis relatively low but varies with patient population, the joints involved, and surgical techniques.105 The most common complication occurring in up to 10% of arthrodesis procedures.87,105 The smaller the area of the bony surfaces and the poorer their vascular supply, the higher the rate of nonunion. Factors that contribute to nonunion include postoperative infection, malalignment of the fused joint, and a patient’s use of tobacco before and after surgery. The method and duration of immobilization of the fused joints are determined by the surgeon based on the site of the fusion, the type of fixation used, the quality of fixation achieved, the patient’s bone quality, and the presence of factors that affect bone healing, such as systemic inflammatory disease and preoperative use of corticosteroids. As with postoperative immobilization, published guidelines for the timing and extent of weight bearing permissible after arthrodesis vary considerably. The same considerations that influence decisions about immobilization also influence the progression of postoperative weight bearing on the operated extremity. The most prevalent practice to substantially restrict weight bear for many weeks after open or arthroscopic arthrodesis. Typically, patients must ambulate with crutches or a walker and not allow to bear weight on the operated side for 4 to 8 weeks. When radiographic evidence of bony healing, partial weight bear permitted while the patient wears a rigid short-leg boot or shoe. Full weight bearing without wearing an immobilizer usually 12 to 16 weeks postoperative permitted. Initially, in Fractured Ankle Management postoperative exercises focus on ROM of the unoperated joints proximal or distal to the joints immobilized. If the patient wears a removable splint, ROM exercises of the unoperated joints confined may permissible early in the rehabilitation program as well.7 For example, after an ankle or behind foot arthrodesis, exercises to maintain toe mobility indicated in addition to knee ROM. For a patient with RA, active ROM is essential in all involved joints not controlled by the immobilization device. When bony fusion occurred and use of the immobilizer discontinued, often signs of post immobilization muscle weakness, hypomobility of joints. During the first 6 weeks, frequent cast changes necessary as swelling subsides. 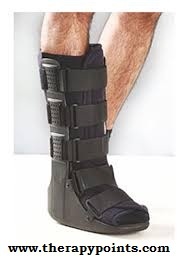 A short-leg walking cast or rigid boot applied at about 4 to 8 weeks, and immobilization continues for an additional 4 to 6 weeks After arthrodesis of the first MTP joint, a short-leg cast or surgical shoe with a flat, rigid sole warned to protect the joint as it heals. Full weight bearing without wearing an immobilizer usually weeks postoperative permitted 12 to 16 weeks.